At walking distance from the historical heart of Ghent, 700 meters from tourist information center. The airconditioned studio has a fully equiped kitchen (including dishwasher, microwave, stove, ...), free access to WiFi and a flat-screen Smart TV. The studio apartment includes a queen size bed which can be stored vertically inside a cabinet to create additional space. Futhermore there are two wall mounted single beds Each unit also features a fully equipped kitchen, a dining table and a bathroom with a shower, free toiletries and a hairdryer. A washing machine and a tumble dryer are available upon demand. Studios At Ghent is located in a lively city district which accommodates a wide range of restaurants, bars, cafés and supermarkets for groceries. The Gravensteen (Castle of the Counts) is a 7-minute walk from the accommodation. It is 1.1 km to Veldstraat Shopping District and 2.9 km to St Peter’s Square and Abbey. Ghent Dampoort Train Station is 3.5 km away and a tram takes you directly to Ghent-Sint Pieters Train Station. Easy access to town center. Very friendly host. This is a true studio apartment. If you need a place close to town that is clean and inviting, this place is great. Wonderful host. Beautiful city. Ghent is a dream. The apartment is great. It has everything needed to be comfortable. and very clean and care. This very well located, and a few minutes walk to the center of Ghent. Easy to park near it, for 3.5 euros a day. A great apartment, and the person who answers is lovely. Despite they say that they have parking, they do not have it. We had to park the car outside ant it was 11 euros per day. The appartment was really clean and it has a really good situation. We never claim to have parking, as we don't have any. I couldn't find anything back in our correspondance about parking, so Iasked the customer when we told this, but she didn't answer. In our street it costs 11 euro per day, but at 200m walk it is only 3,5 euro per day. L'appartement est très bien décoré, pratique, bien équipé et propre. Correspond en tout point à la description. L'emplacement est idéal pour qui veux découvrir Gand car tout est faisable à pied. Seul bémol cet appartement fait parti d'un ensemble de 3 appartements et malheureusement durant notre séjour les occupants des 2 autres appartements était manifestement venu pour faire la fête (retour alcoolisé et bruit jusque 3/4h du matin), il faut dire qu'il y avait des fêtes sur Gand durant ce WE. 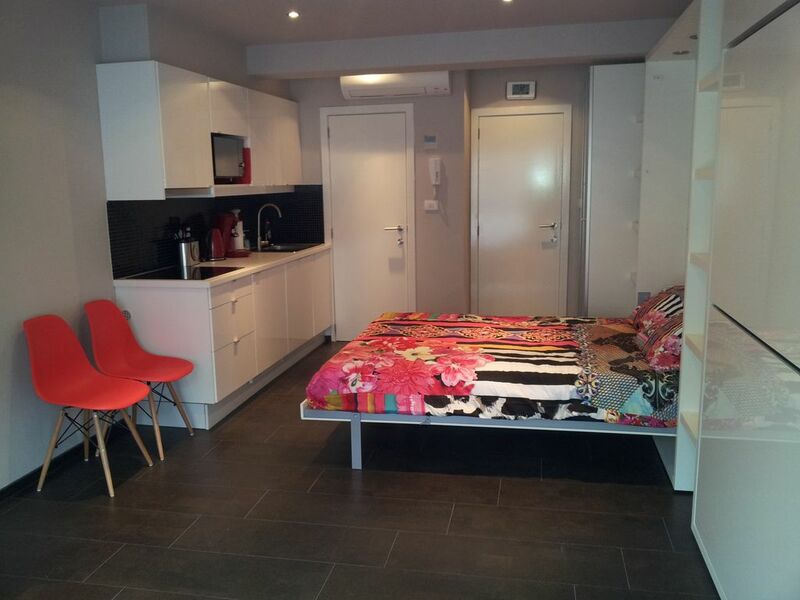 Des nuisances qui ont un peu terni notre avis sur ce superbe appartement. Je suis vraiment désolé du bruit. Le mieux dans ce cas c'est que vous m'appelle pour que je puisse demander aux autres clients de ne pas faire du bruit. Close to historical center of Ghent, but also easy access to Bruges, Brussels and Antwerp. We have 3 Studios. First, second and third floor. Stairs are rather steep, but there is an elevator for luggage and shopping items (not suitable for persons). Tourist tax of 3 euro per adult per night is charged seperately Bedlinen is included but towels are not - if you cannot bring your own towels, you can rent them at 4 euro per set.